welcome on board of my first flight with an Airbus A380, the king of the skies. Yes, I am being sincere. Even though I am traveling so much and I am an aviation lover, I have never had the chance to fly with the A380 so far. 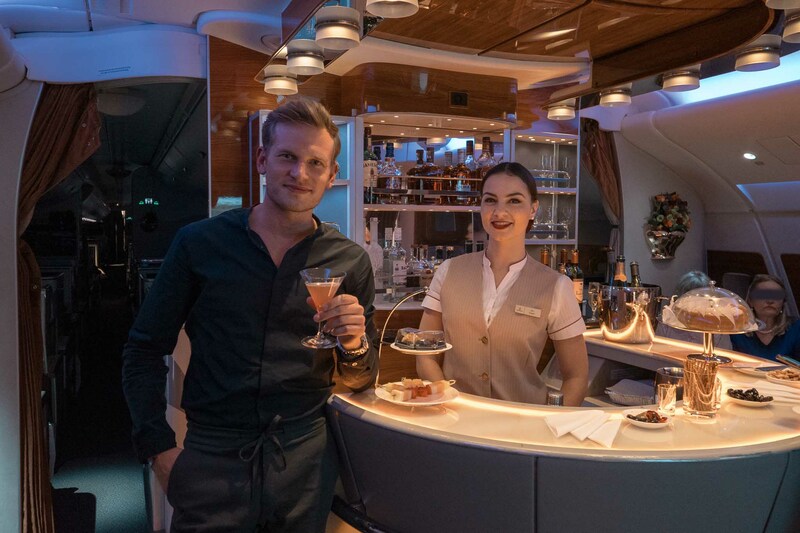 To make my first flight an experience, Emirates welcomed me on board their flagship for a flight to Mauritius. In fact, it was also my first flight with Emirates. In this blog, I am sharing those two premieres with you. Finally! I was excited like a little boy to go on my first flight the king of the skies. During the aerospace exhibition in Berlin this year, the ILA, I already took a glance inside the A380 of Emirates, which was displayed on the apron. At this point, I thought I will take forever until I will take a flight on board of the biggest passenger airline. 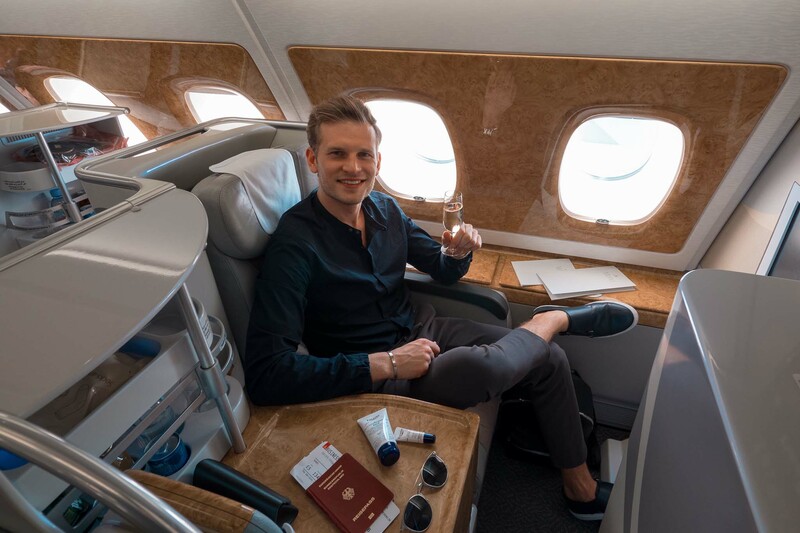 But in the end, it took only 6 months to find me drinking a champagne in Emirates Busines Class on the way to Mauritius. I am flying the A300, which was the first model ever built by Airbus. Its first flight was in 1972. About 20 years later in June 1994, Airbus announced its plan to develop a very large airliner, designated as A3XX to be a competitor to the B747. In 2005 the A380 had its first flight. The A300 is already a huge aircraft with 54 m length, 45 m wingspan and a maximum take of weight of 170 tons. Compared to the A380 this is small and light. The length is 72 m, the wingspan 79 m and the maximum take-off with is 575 tons. Impressive figures! 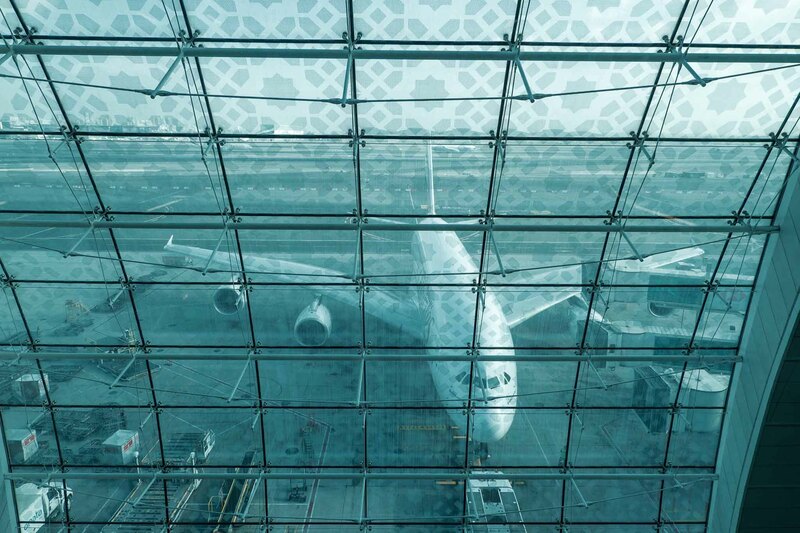 More economical than a car: The A380 consumes only 4,05L fuel per 100km per passenger. Biggest aircraft? No there is one more airplane called Antonov An-225, it is larger than A380. Wiring: If all the wiring in the A380 is laid end to end, it will stretch from Edinburgh to London – 320 miles. Paint: More than 3600 liters of paint is required to paint the exterior of the aircraft. Runway: Only 20 runways in the world are now fully capable of handling A380 aircraft. Others are not long or wide enough or not technically equipped for A380. 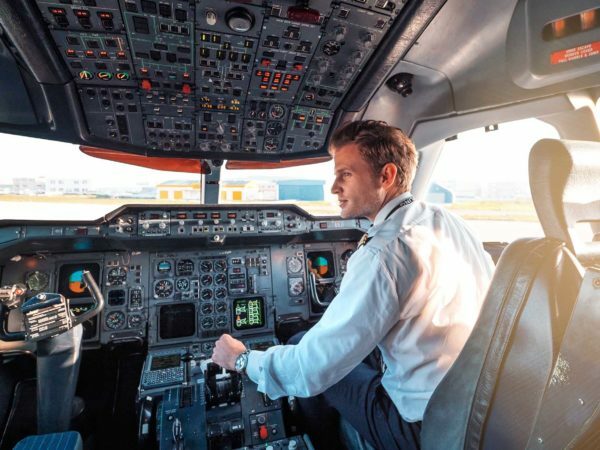 Flight hours: The Airbus A380 is designed to fly for 140,000 hours – meaning it could fly around the world more than 2,000 times in its lifetime. Orders: as of September 2018, Airbus had received 331 firm orders and delivered 230 aircraft; Emirates is the biggest A380 customer with 162 ordered of which 105 have been delivered. Emirates was only founded in 1985. Today the Gulf carrier, based in Dubai operates 3,600 flights a week to 140 cities in 80 countries around the world. 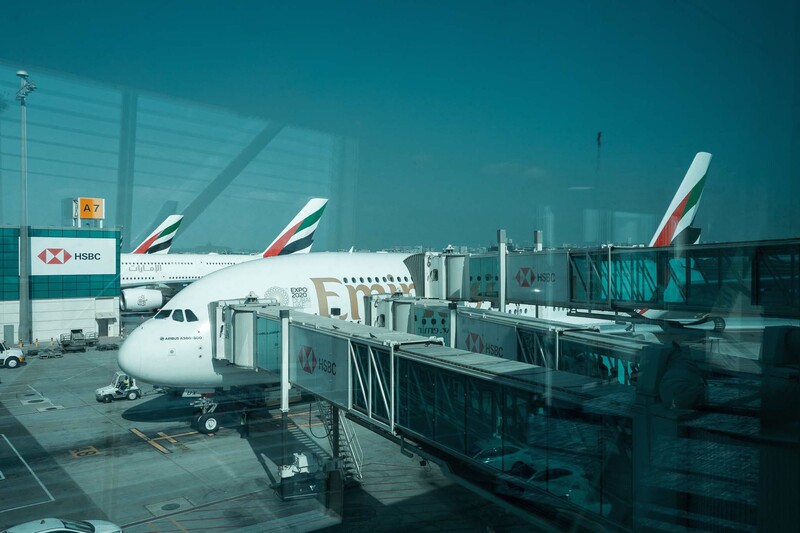 Emirates only uses two kinds of airplanes, the Airbus A380 as well as the Boeing 777. Itis is the worlds largest operator of both airplane types. 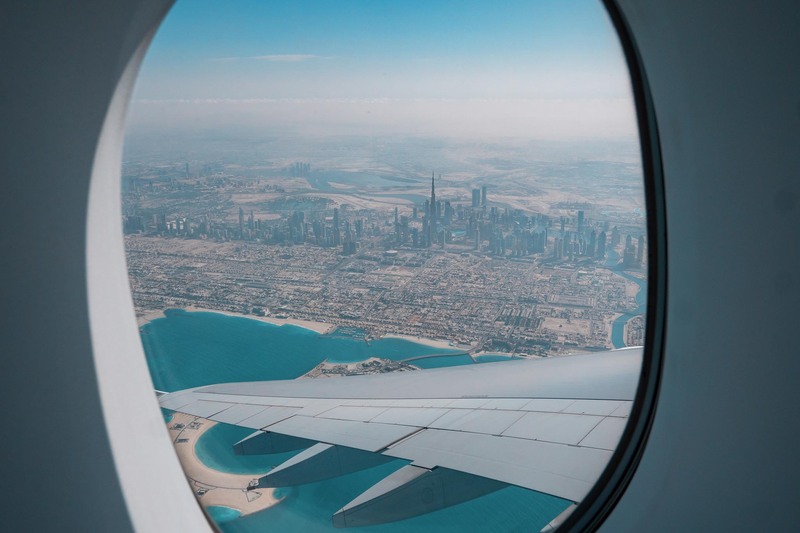 In total Emirates flies 234 planes. International crew: Cabin Crew from over 150 different countries. you will find at least 12 different nationalities of cabin crew. 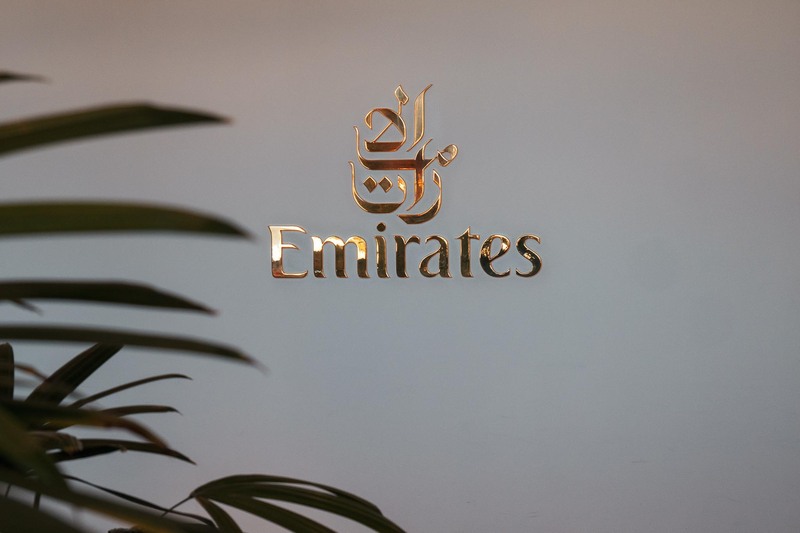 In total Emirates has over 60,000 employees. First Flight from Dubai to Karachi was in 1985 on a Boeing B727 for the Royal Family. 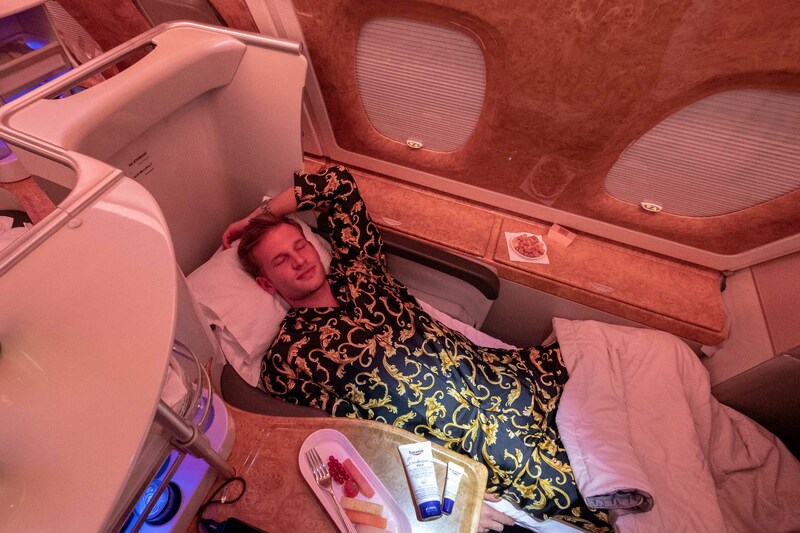 Longest Flight takes 17 hours and 25 minutes from Auckland, New Zealand to Dubai on an A380. Upperdeck! 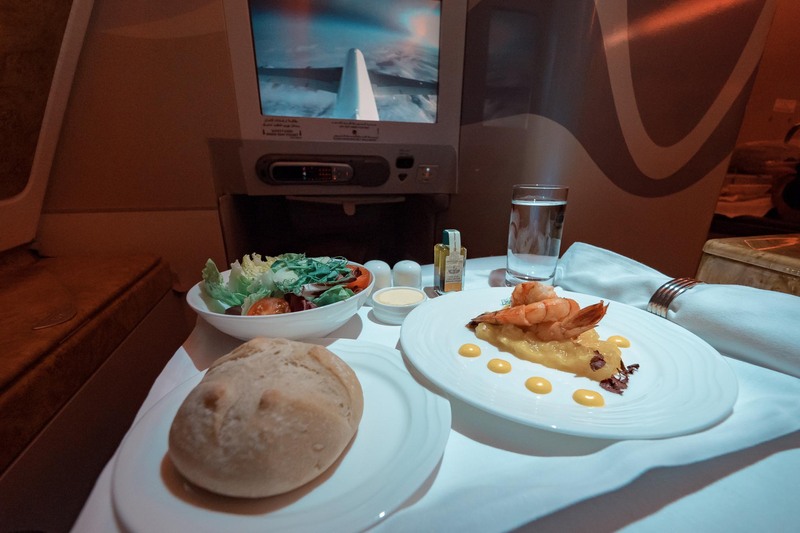 Flying in Business Class is truly a privilege and a luxurious experience. 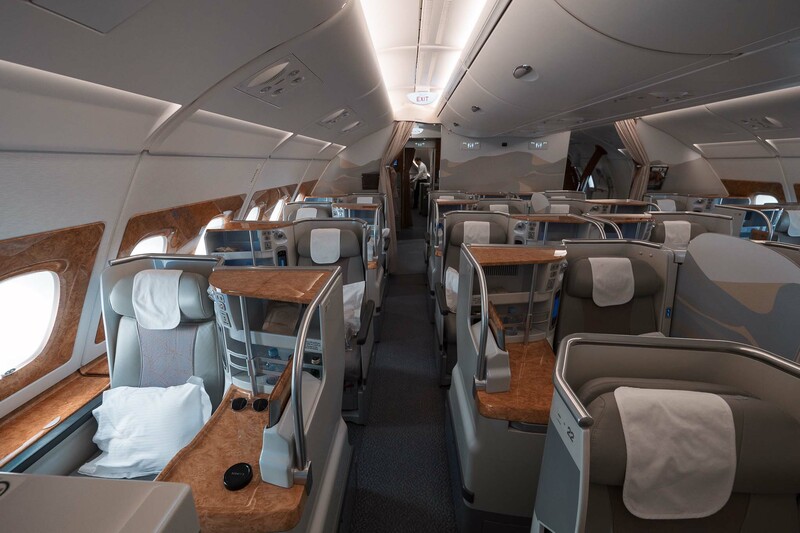 The entire upper deck of the A380 comprises the Business Class and First Class. The layout of the Business Class offers all seats direct aisle access. Especially the direct window and the middle seats (more for couples) grant extra privacy and storage. On all three A380 flights, I chose a seat in the rear cabin at the window. The seat right behind the bulkhead (row 23) is great since there is no other passenger right in front of you. 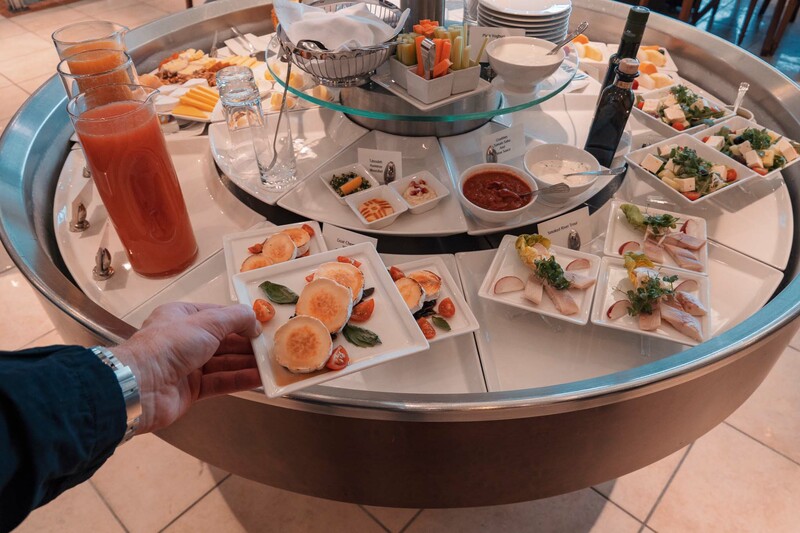 I enjoyed a tasty menu of regionally inspired gourmet dishes and drinks from an endless beverage menu. A specialty on Mauritius you could choose coconut water as a welcome drink. The seat also seamlessly reclines into a fully flat bed with a soft, comfy mattress and a cozy blanket. The „Fly better“ experience starts already before the flight. Since there is no flight from Berlin (unfortunately) I had to drive to Frankfurt Airport to catch my connection from there. 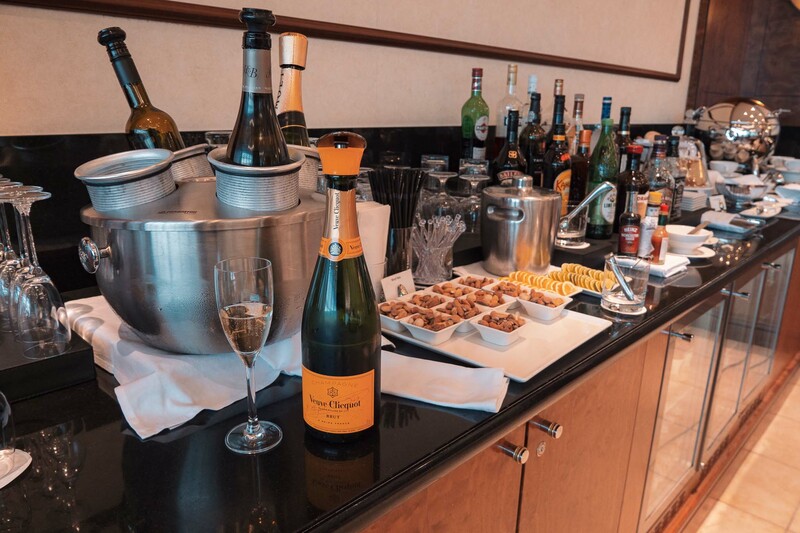 The Business Class ticket includes either a free First Class Deutsche Bahn round-trip ticket (Rail & Fly) or the Chauffeur-drive. 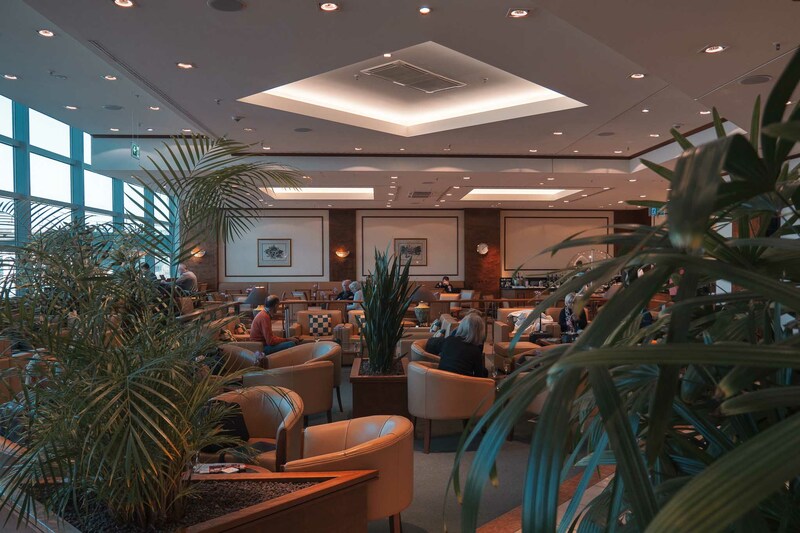 At Frankfurt Airport I arrived extra early so I could visit the Airport Lounge of Emirates. A picture/video is worth 1000 words. 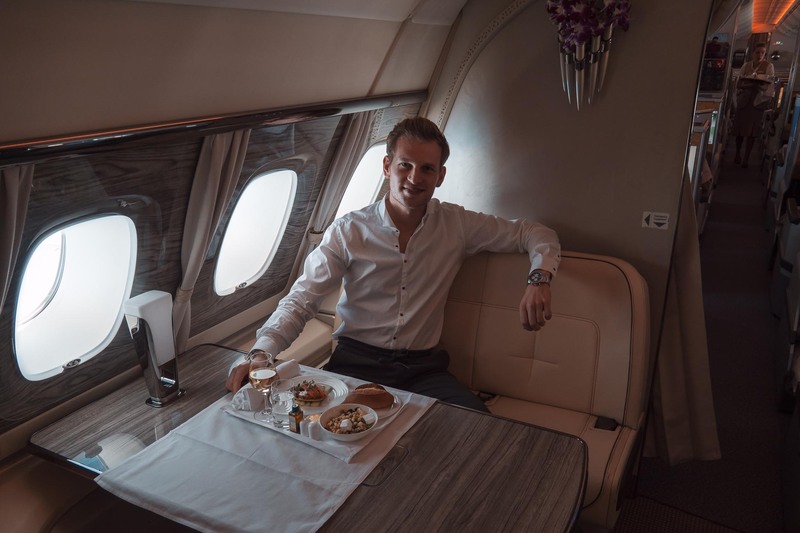 So check out my Vlog about my first time flying A380 with Emirates. It is already a highlight itself to fly with the A380. The aircraft is extremely quiet inside the cabin. I was impressed that I could not really hear the take-off thrust on departure. 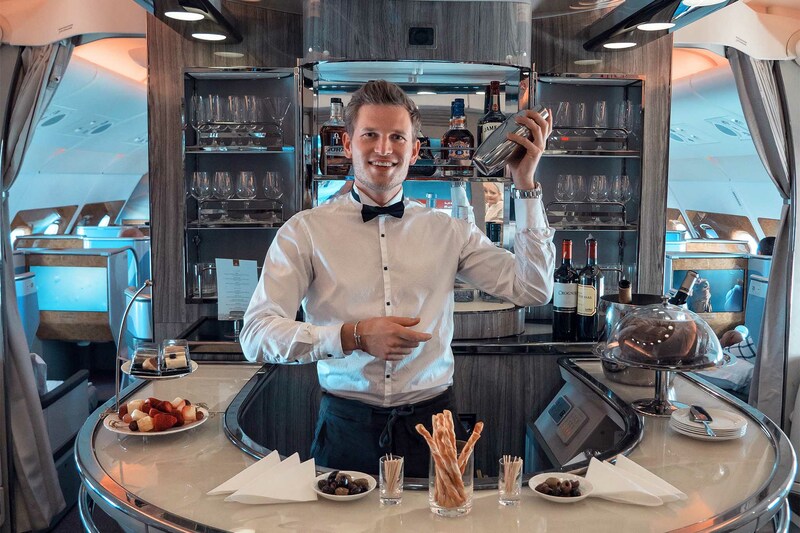 An onboard lounge: Let’s have fancy a drink in 36,000 feet in the onboard lounge located in the rear section of the upper deck. 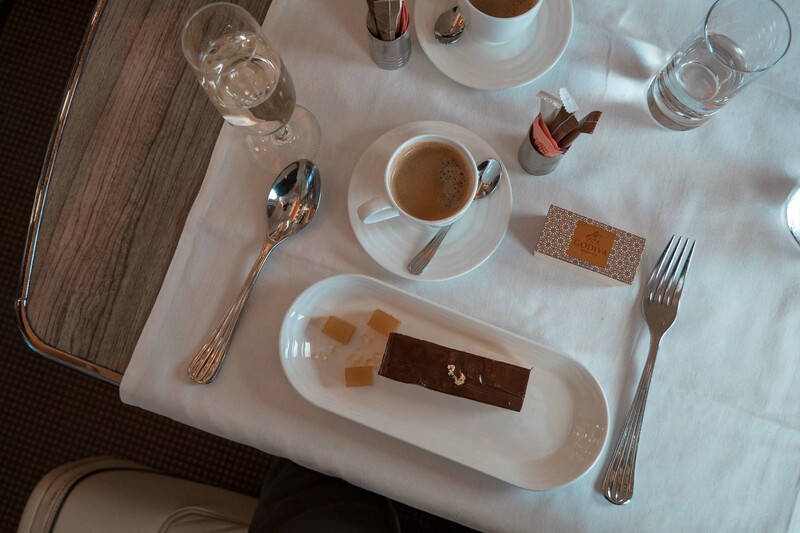 A great way to get in contact with other passengers and to have a light snack in between meals. On the flight to Mauritius, the cabin supervisor invited me to have lunch at the dining table in the lounge. It felt like I was flying on a private jet. 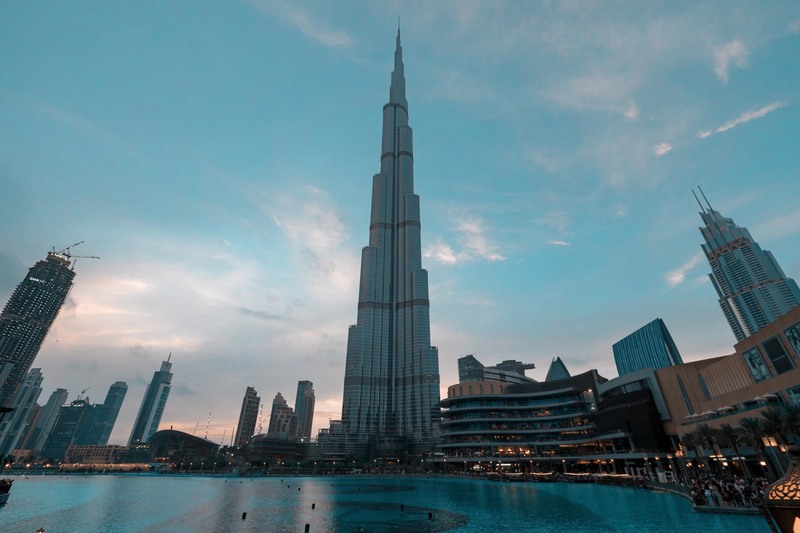 On the way to Mauritius, I decided to do a short stopover in Dubai. It was only for 30 hours, but enough time to go shopping, to have a tasty dinner and enjoy some glamours vibes of the city of superlatives. I totally can recommend doing a stopover but plan for a couple of days so you can experience more. 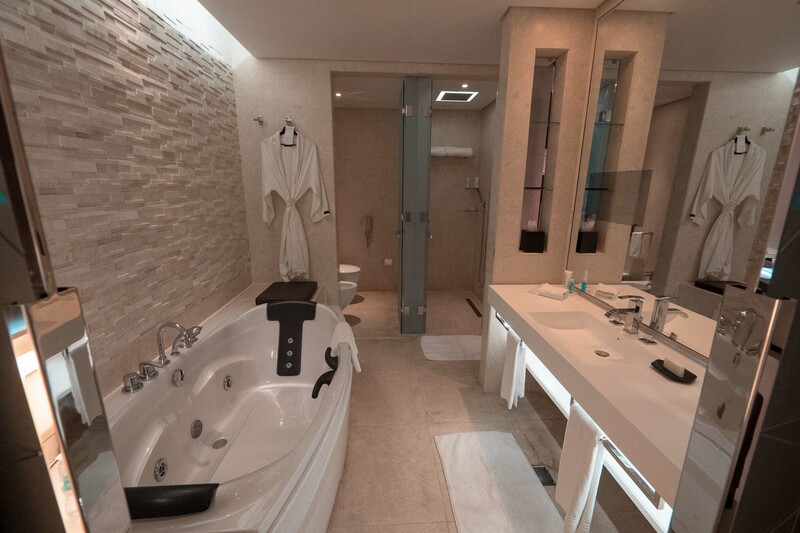 I stayed in the Le Meridien Airport Hotel. 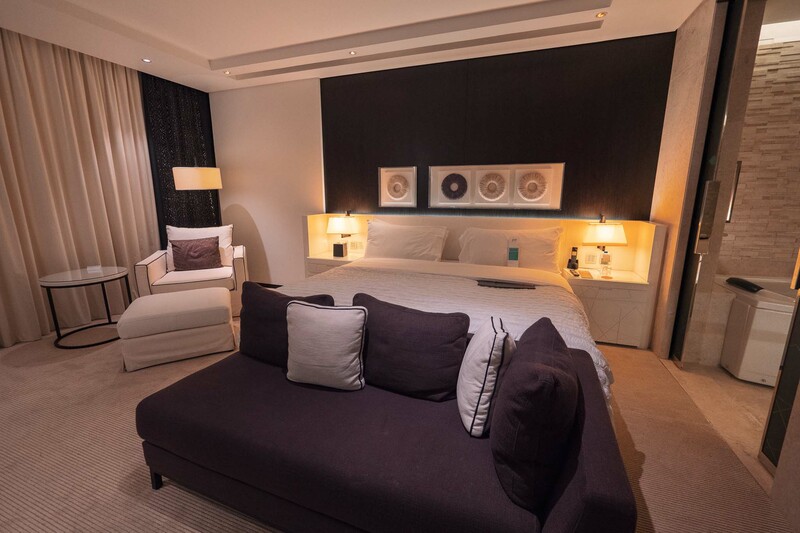 It is only a 10 minutes drive from the airport and 15 minutes to the downtown area of Dubai. 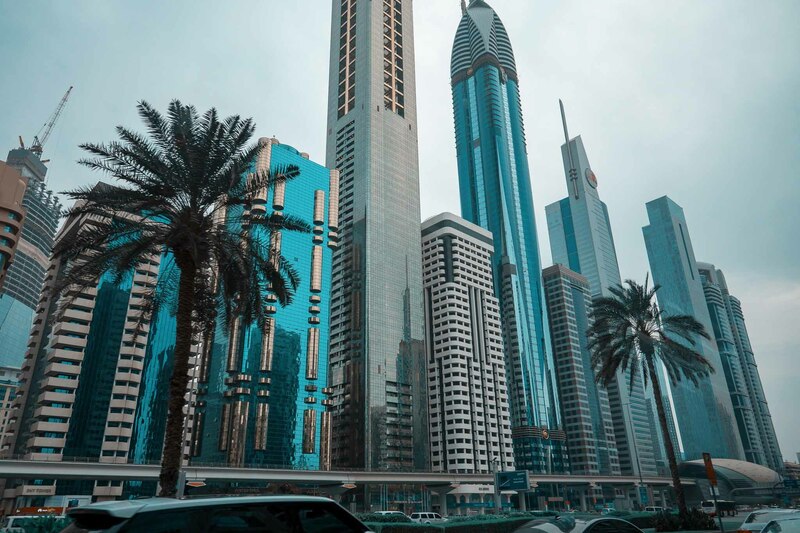 Check out my Dubai Vlog from my vacation in April, If you want to find out about activities you can do. Thanks to the flight crew of Emirates for making my first A380 experience remarkable. I hope you enjoyed the journey as much as I did. 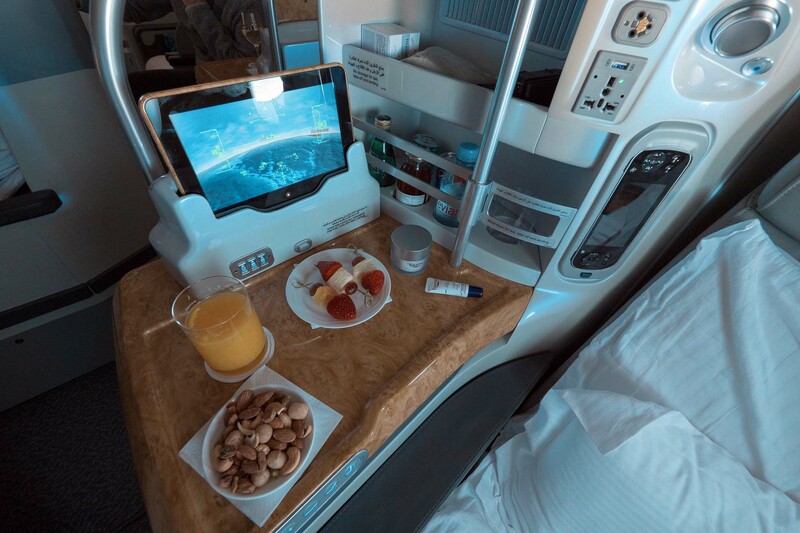 Have you flown on board of an A380 before? Leave it in a comment below and subscribe to my newsletter with your email! Weiter Nächster Beitrag: Urlaub im Paradies von dem ich immer geträumt habe?